Michelle Krebs is senior director of automotive relations for Cox Automotive and executive analyst for Autotrader, based in Detroit. An award-winning automotive writer, Krebs is a frequent guest on CNN, CNBC and FOX news programs. 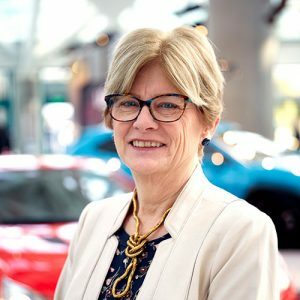 She provided expert commentary in the award-winning documentary, “The Revenge of the Electric Car.” Before joining Cox Automotive, Krebs was a senior analyst and editor for Edmunds.com. Previously, she ran a successful editorial services business where she was the first female car reviewer for The New York Times and the first woman to participate in the selection of Motor Trend’s Car/Truck of the Year. She was a reporter and editor for Automotive News. She served as president of the Society of Automotive Analysts and the Automotive Press Association. She is a graduate of Syracuse University.